For many people, a camping trip is the epitome of a great vacation. If you like to camp, you are probably no stranger to the great outdoors and the myriad benefits that sleeping in it can provide. Unfortunately, camping can be a struggle if you aren’t willing to give up the luxuries of everyday life. One of those so-called luxuries? A good night’s sleep. Have you ever camped in a traditional single sleeping bag? If you have, you probably found yourself struggling against its confining zippers, sweltering under an unforgiving down interior, or freezing once the temperatures drop below a certain degree. This is where a double sleeping bag can come in handy. The best double sleeping bags are equipped with durable liners that allow you to choose exactly how cozy you want to be. Better yet, these sleeping bags are designed to be sleeping bags for two, allowing you to sleep with a partner or to give you a bit more legroom. 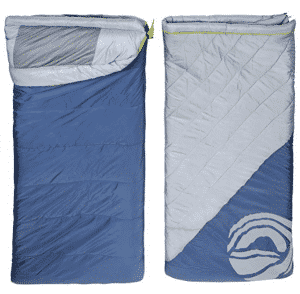 The King Cove Double Sleeping Bag by WildHorn Outfitters is one of the best double sleeping bags around, offering a roomy interior as well as a durable outer shell. If you’re sick of suffering from a poor night’s sleep caused by your existing single or double sleeping bag, read on to learn why the King Cove Double Sleeping Bag might be the right upgrade for you. 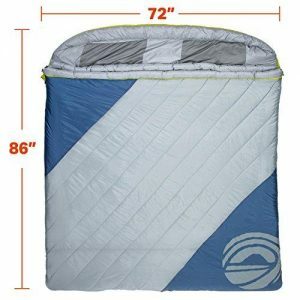 This double sleeping bag is one of the largest double sleeping bags around, with dimensions of 86 by 72 inches (yes, just like the dimensions of a California king size bed). You can easily make this sleeping bag 2 x single bags by using the very handy zipper technology incorporated into the King Cove. Even when used in tandem with both pieces, this double wide sleeping bag offers plenty of open sleeping space for both partners. The bag has a removable interior liner, making it easy to wash in your washing machine. The liners are breathable and wick moisture, meaning you will be able to get several uses between washings. The internal zippable liner can easily be reused when the bag gets grimy. This sleeping bag for two can be used at temperatures as low as 30 degrees, making it ideal for winter camping. It is rated based on TruTemp comfort ratings, meaning that sleeping bags are rated to optimal comfort – not survival, as many comparable sleeping bags are. You will be plenty warm in this sleeping bag, which offers waterproofing abilities and a hood that can be cinched in freezing temperatures. Made out of nylon ripstop, it is incredibly durable and stays in excellent condition no matter what kind of conditions you put it up to. Finally, it has a stylish design with modern graphics and colorful patterns to make it a staple in your go-to camping gear stash. This double wide sleeping bag is frequently referred to by customers as being “insanely huge,” and that’s no overstatement! The King Cove is sized to fit a California King, making it a good choice for larger campers or simply for individuals seeking a bit more space to stretch out. Many customers initially shied away form a sleeping bag this large out of fear that it wouldn’t wash well. However, this bag’s handy interior liner makes it possible to have a large sleeping bag as well as a sleeping bag that doesn’t smell like sweat. Customers report out happily on the King Cove Double Sleeping Bag by WIldHorn Outfitters, claiming that it is one of the best two-person sleeping bags you can buy for the money. It is ideal for campers traveling in jumbo-sized tents or for those looking to sleep more than two people in a sleeping bag (such as parents with young children that they cannot leave alone in a separate sleeping area). While this sleeping bag isn’t the smallest on the market, it offers no apologies as such. It is, according to the manufacturers, “unapologetically huge,” but that’s the way it’s supposed to be. A big, warm, cozy sleeping bag, it will make you feel like you are cuddling with your partner at home instead of the backwoods. At the same time, it will allow you to enjoy the very best of the outdoors. 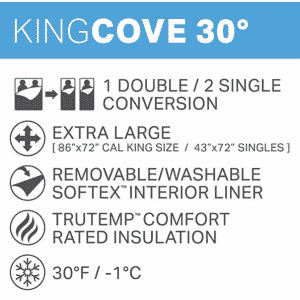 Consider the King Cove Double Sleeping Bag if you are looking to purchase one of the best (and roomiest!) sleeping bags on the market. If you are like my wife and I and like to indulge in your camping comforts then why not check out our double camping cot reviews. This is serious glamping in style. Of course it has its negatives with regards to lugging a camping cot to your campsite, but my oh my its totally worth it once you are set up. Check out the post Here!